X Frame - Fully Wrapped, Heavy Duty 12 Gauge Steel Tube: Provides rugged durability and protects the generator and fuel tank from damage. Steel Lifting Pocket: Designed for easier lifting and transportation on jobsites by crane or forklift. 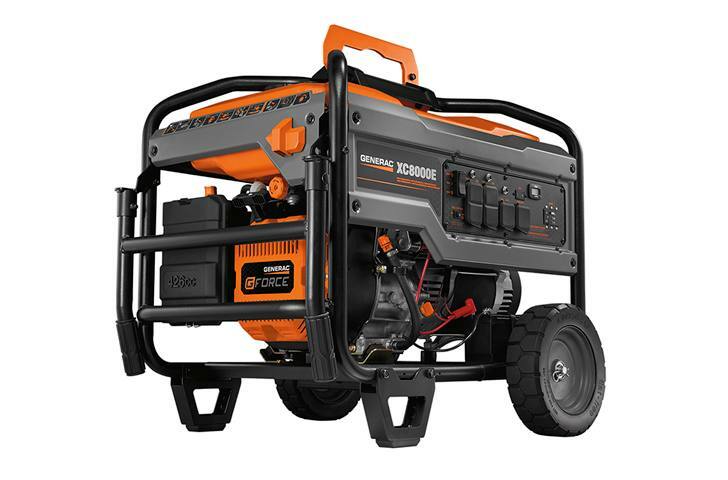 Generac G-Force Engine: Features Best-in-Class power with full pressure lubrication and is optimized for generator use. Impact Resistant Fuel Tank Design: Recessed tank edges reduce damage when transported by forklift. 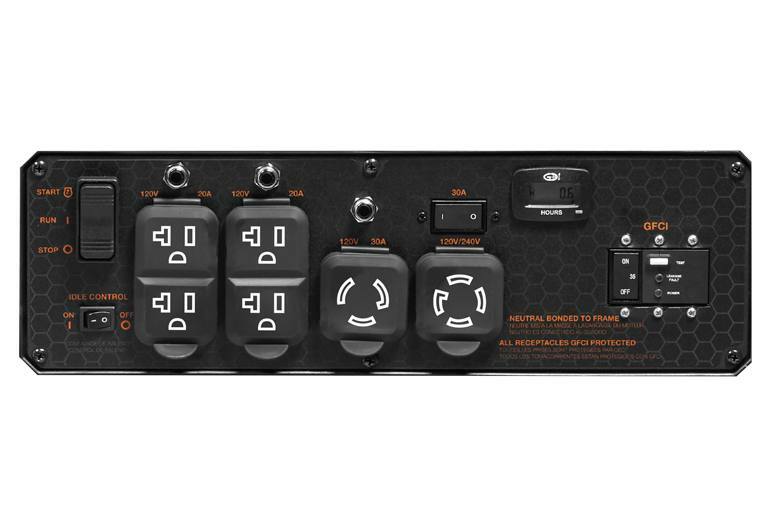 Full Panel GFCI Protection: OSHA compliant with covered outlets to protect from the elements. Easy Access To All Routine Maintenance Areas: Including filters and spark plugs; no need to remove fuel tank or side panels. Never Flat Wheels With Steel Hubs: Makes movement around the jobsite easy and efficient. Protected Axle: Integrated into frame, shields from impact during transport. Welded Steel Feet: Reinforced for superior durability. Fold-Down Locking Handles: Features one-handed locking mechanism for easy storage. Engraving Plate: Allows unit to be tagged / cataloged for use in contractor and rental fleets. TruePower™ Technology: Provides clean, smooth operation of sensitive electronics, tools and appliances. Idle Control: Reduces noises and conserves fuel for extended run-times.